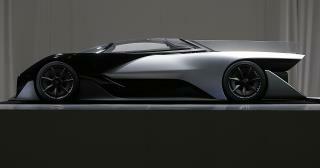 Is Faraday Future's Bonkers-Looking Car the Future of Electric Vehicles? Is This Bonkers-Looking Car the Future of Electric Vehicles? Vanity Fair explains why Faraday Future's future may not actually be in cars as we know them. "The brand will not be creating cars, per se, but seamless mobile delivery systems for your wireless digital life…You can download and nostalgically watch old seasons of Community while rolling from New York to Chicago if you don’t have to touch the wheel." If you think that sounds like a bunch of nonsense, Jalopnik discusses why Faraday Future's debut left more than a few people disappointed and confused. "Faraday Future’s marketing message of being 'a new kind of car company' that would 'disrupt the industry' and 'change everything we know about cars' rang more than a little hollow." Meanwhile Mashable goes into how Faraday Future used virtual reality to go from nothing to an actual car in only 18 months. "For all the amazing things about the car—and there are plenty—perhaps one of the most mind-boggling is the speed with which its designers created the 1,000-horsepower, single-seater EV race car from scratch." Despite the Faraday Future hype, Forbes warns you shouldn't count out Tesla just yet. "Faraday Future debuted a stunning electric vehicle concept at CES 2016 on Monday night. But Tesla can do a lot between now and 2018 (or thereabouts) when Faraday plans to bring out a real car." Finally, Tech Insider has a little something for the graphic designers, discussing the Faraday Future logo, which has garnered reactions from "fiendishly clever" to "looks like a fish" to "a bit derivative of the Police's album Ghost in the Machine." If it doesn't offer any new battery or drive train technology.. It is Nothing but show.. Tesla only claim to fame was putting "laptop" type dry cell in a car.. Increased the energy density over Lead Acid.. at a significant cost.. Tesla didn't offer any New Real tech.. Electric cars are lame..
Oh goody, another million dollar VEhicle. It is not a "zero emission" car unless it is charged directly from solar or wind energy. Plugging in and charging from the grid traces back to coal and gas fired power plants. Plenty of emissions there.